For a few weeks now, bright orange posters have proclaimed from their posts around campus that Short-Order Poems are coming our way on Nov. 23 from 1:30 p.m. to 3:00 p.m. in the coffee shop. 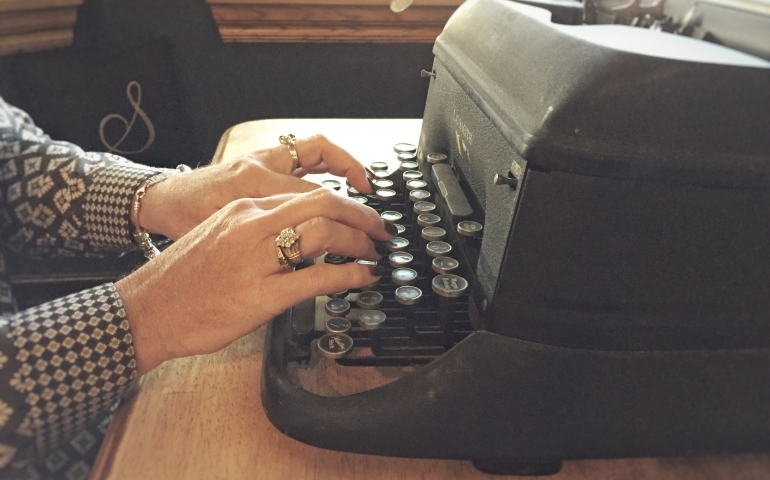 If you have been by an H and 8th event in downtown Oklahoma City, you may have seen a few people seated at a table tapping away on typewriters with their “Short-Order Poems” sign giving the only explanation as to what they are doing. A simple explanation of these poems and the event coming to campus is that poet Chad Reynolds will use a typewriter to create a poem on the subject of your choice for a fee. This will be done in a short amount of time. The announcement of short-order poems coming to campus has got me wondering: who needs poetry? Because of my own love for the art, my ears are always especially attentive to any mention of poetry by anyone. I have been hoping to find out how SNU values it and uses it. What I expect and I’m sure others assume is that many students may feel like poetry is some froo-froo girly stuff or slimy romantic waste. I beg to differ, and I have found some evidence that would support my claim as well. I was thrilled when Dr. Neuenschwander quoted a few verses while he shared at chapel last month. This month I was happy to see the cute little rhymes ladies have been using to ask the fellas to TWIRP. This week, myself and those in Genre Writing have been writing our own poetry. Friends are always sending me either poems they’ve written or poems they think I should read (which I appreciate and encourage). Rachel Smith, junior, remembers a time in chapel when a poem Blair Spindle quoted “hit home” for her. With these examples I simply suggest that poetry is indeed useful to us. Just like an artist splashes life in color onto a canvas, a poet writes life in words into a poem. Sometimes it’s beautiful, sometimes it’s ugly; it may be hard to understand, it may make more sense than anything you’ve ever read. The time I have spent reading, understanding and writing poetry I will not soon regret. Perhaps you remain unconvinced of the usefulness and power of poetry. Maybe you think poetry has different uses than what I have mentioned. You can leave your comments on how you use poetry below. You could even leave a poem of your own. I hope many of you will enjoy taking home a poem created just for you this Thanksgiving.